Yesterday I saw a commercial about Common Core that proved to me that liberals are either blind to its implications, or trying to blind the public about it. Unfortunately I have not found an online version of it to include in this post (as reference) but I will add it if I do find it. The Common Core State Standards Initiative is an educational initiative in the United States that details what K-12 students should know in English language arts and mathematics at the end of each grade. The initiative is sponsored by the National Governors Association (NGA) and the Council of Chief State School Officers (CCSSO) and seeks to establish consistent educational standards across the states as well as ensure that students graduating from high school are prepared to enter credit-bearing courses at two- or four-year college programs or enter the workforce. In the commercial, in order to snuff the opposition argument about local control, the commercial actually makes the argument that local teachers have autonomy on how to teach the Common Core program. But that really doesn't get to the core of the problem. Pardon the pun. The problem IS NOT whether there is local control of how to teach to the Common Core. 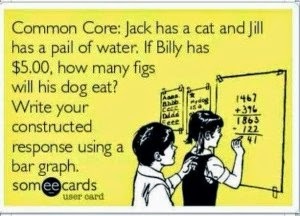 The problem is the content of the Common Core. True local control means that local teachers and school boards decide what to teach, not how to teach what they are told to teach. If the Common Core required teachers to teach the merits of Nazi Germany, it doesn't matter how you decide to teach that, you are still teaching something bad. Common Core is rooted in the progressivist idea that a group of centralized planners are better at deciding what is best for everyone than people themselves would be. That didn't work in Soviet 5-year plans and it won't work in Washington D.C. What makes sense in learning in Alaska may not make sense in Texas or Florida. The fact is that diversity of ideas is what makes America great. That is as true in education as it is in business. If there were indeed one clearly superior way to teach students (with respect to both what and how), then it will evolve on its own anyway, out of necessity. So far it hasn't because it is not clear what is the one best way that every state and district has just got to adopt. It's just like the Solyndra debacle all over again. The government is picking winners and losers, in this case in education. It's because they want to control the agenda. But the real problem is that if they were best at picking the best, every decision they made would be correct. Obviously that is not the case.